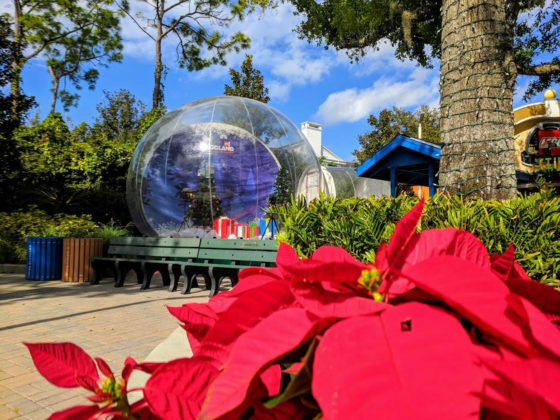 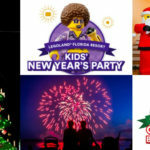 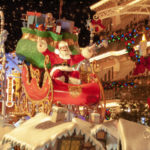 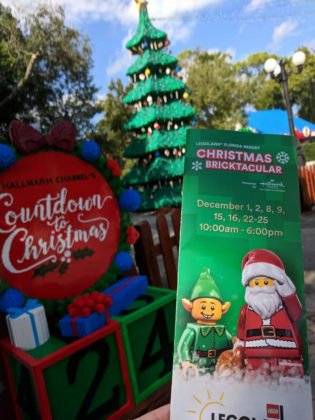 The sights and sounds of holiday fun can be found throughout Legoland Florida as holiday wreaths, garland and Christmas trees dot the landscape. But, during their Christmas Bricktacular (December 1-2; 8-9; 15-16; and 22-25) you’ll find even more Christmas-themed activities and entertainment. 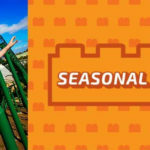 Entering the park, we discovered several delightful photo opportunities for season. 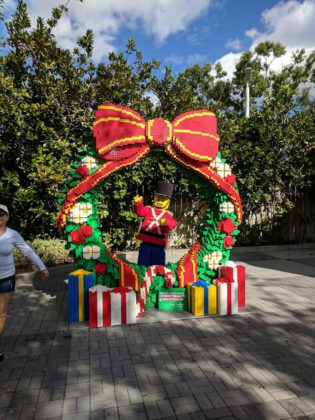 An oversized wreath had a Lego toy soldier at times but was an adorable frame on its own. 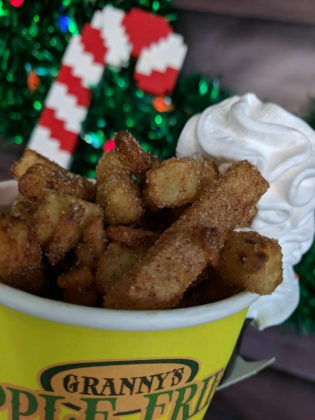 Across the way, by the Studio Shop, was a giant snowglobe style photo opportunity but my first stop was Granny’s fries to sample the Christmas spiced apple fries. 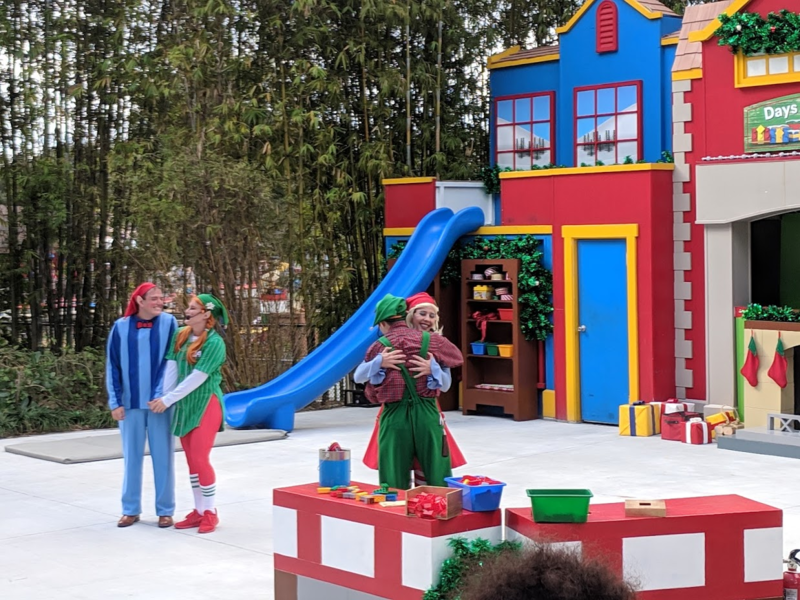 While I waited for my tasty treat, my family headed over to Duplo Valley. 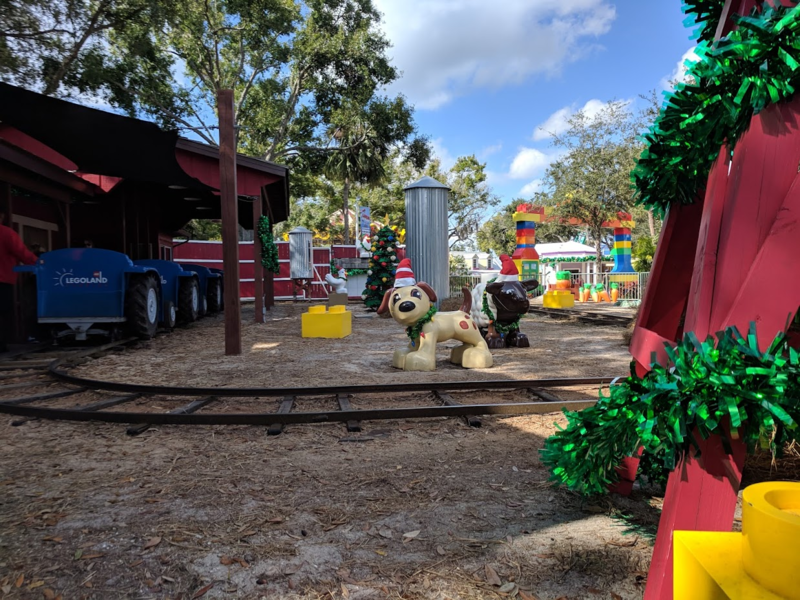 The Lego man at the entrance to DUPLO train was wearing an ugly Christmas sweater and the farm animals at DUPLO tractor had wreaths hanging around the necks. As we wandered Duplo Valley snacking on the tasty treat (which was like apple pie in a cup), bluegrass variations of Christmas tunes filled the air along with the goofy Grandma got run over by a Reindeer. Speaking of which, be sure to travel past the area’s main attraction (or at least it is to my crew) the splash zone to find a shaded picnic area. 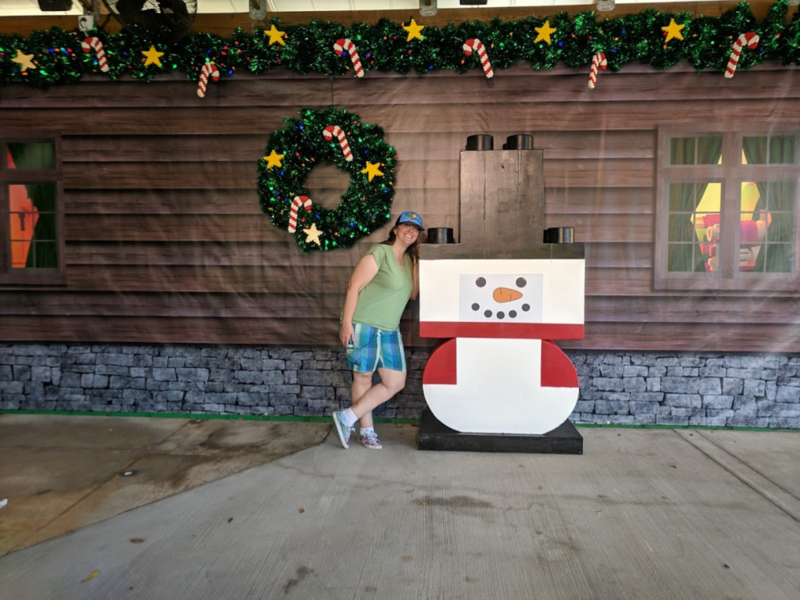 We discovered two photo spots here. 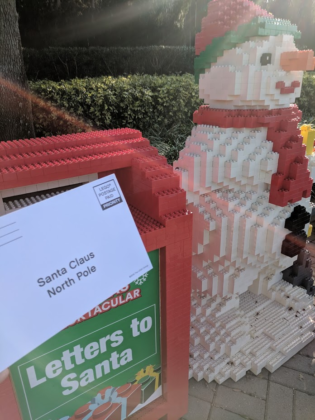 One with LEGO snowman photo and the other featuring Santa with LEGO reindeer pulling a sleigh. 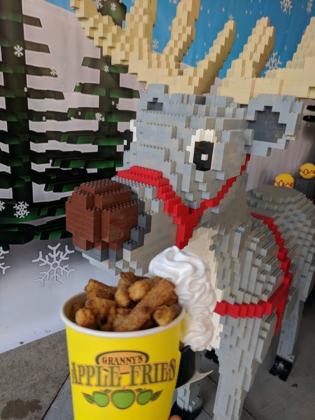 During the Bricktacular events, Kingdom Cones offers a pumpkin flavor burst for their soft-serve ice cream along with their usual array of flavors like strawberry, caramel or tropical orange. 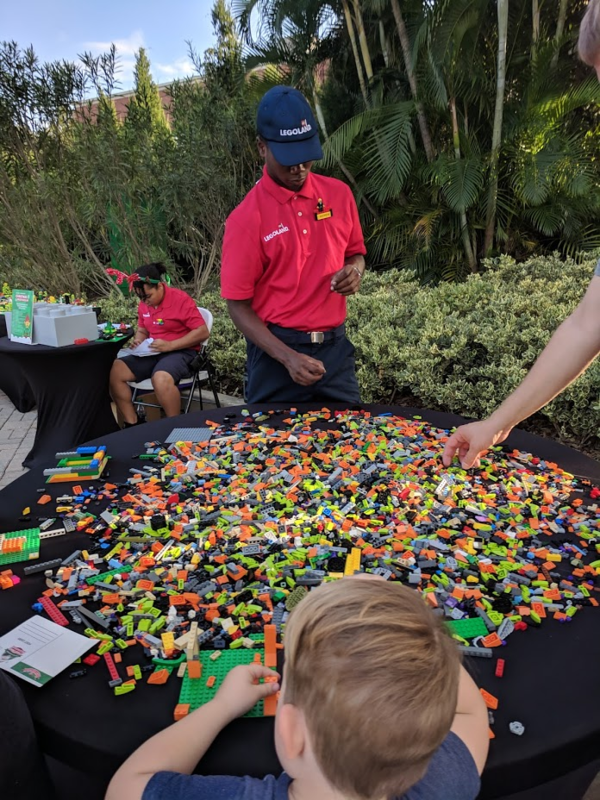 We were impressed by the size of serving. 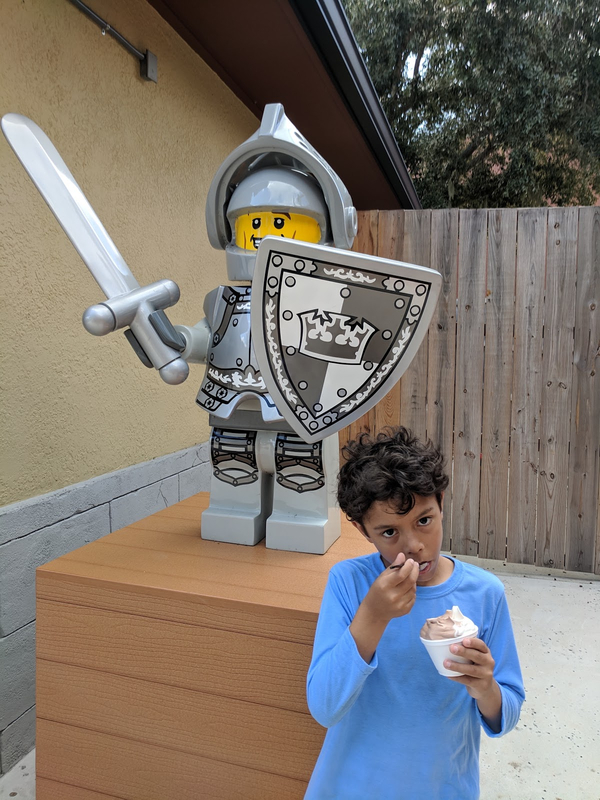 My little guy barely finished half of his $4.00 kids size soft serve. 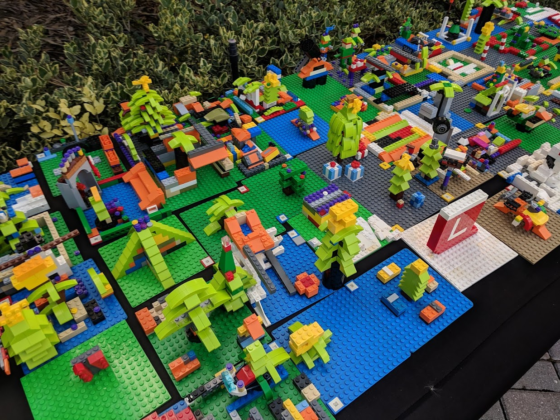 Adjacent to the Kingdom Cones is the Forestmen’s Hideout — an imaginative play zone of bridges, net climbs, etc. So consider ordering your ice cream after your little ones and then relax and enjoy it while they play. 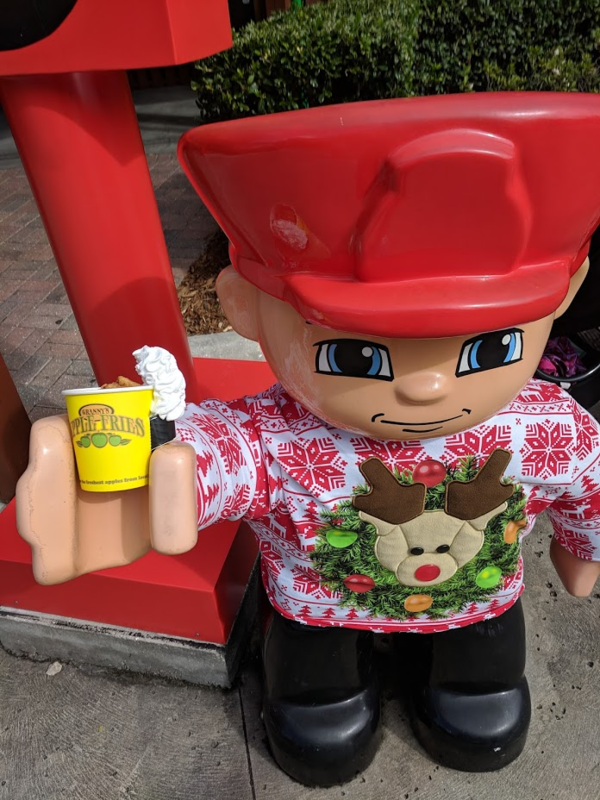 At the Holly Jolly Jubilee, we took part in the elves celebration of a job well done. 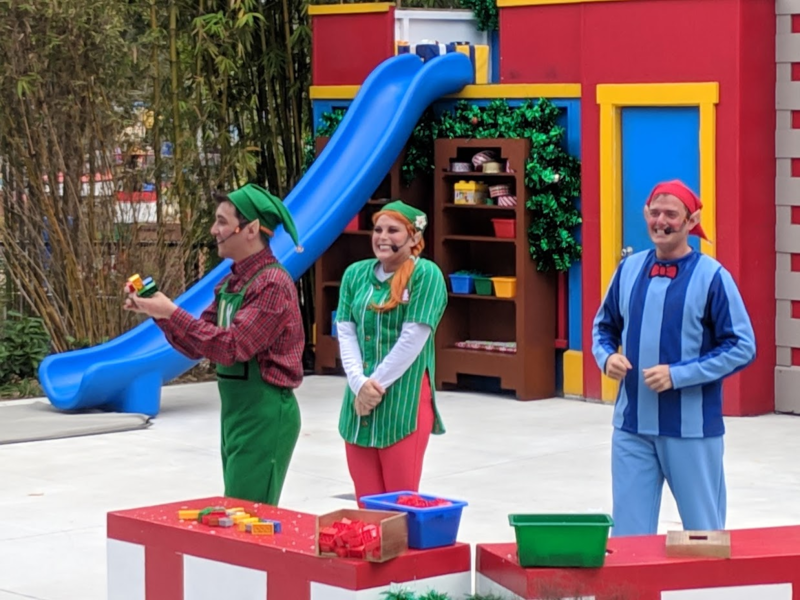 Weaving together a collection of high energy familiar Christmas tunes we watched Alfred, Juniper, Evie and Cedar get so wrapped up in event planning that they forget but eventually rediscover what truly makes a Christmas party important. 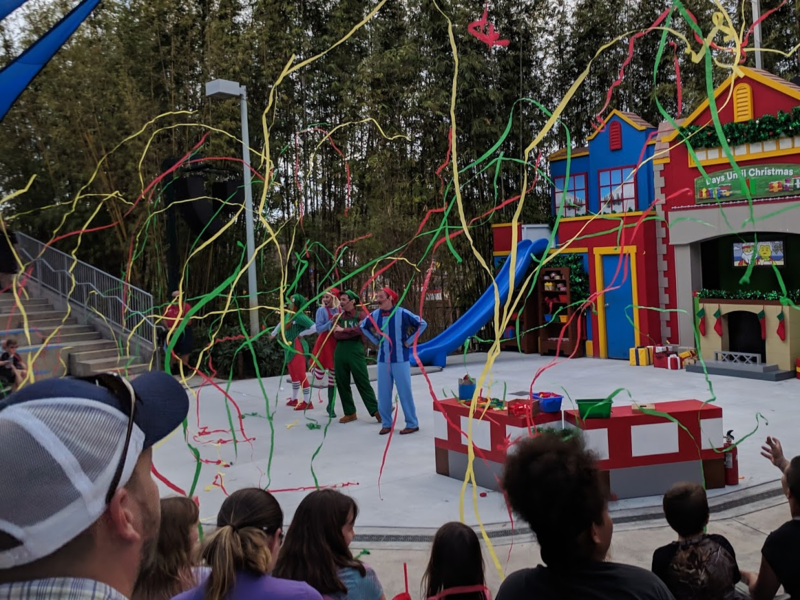 The show lasts about 17 minutes and is in an outdoor amphitheater setting with wide aisles that makes it easy for families with smaller children to give it a try. Circling the signature MiniLand section of Legoland were five stations of holiday fun. 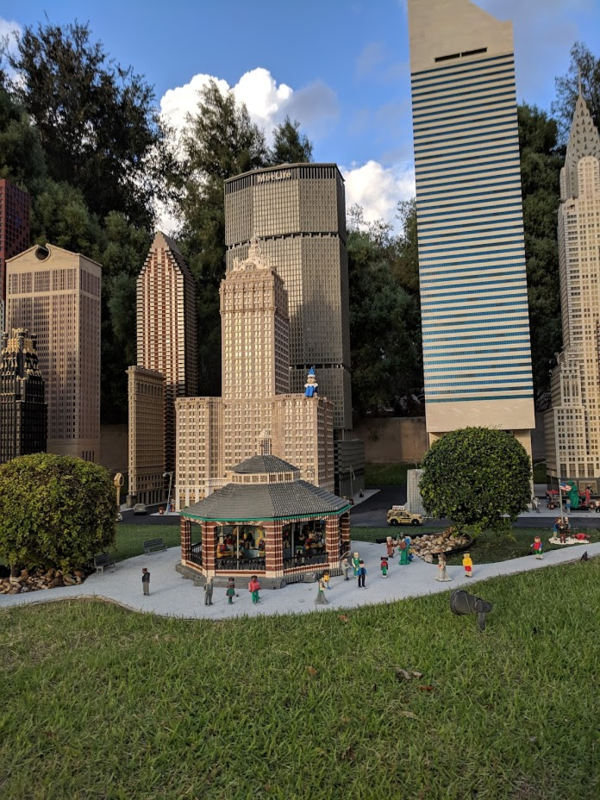 MiniLand itself is always a highlight of the Legoland visit with all the nooks and crannies. We love to explore in the recreations of Las Vegas, San Francisco, Manhattan along with Florida sites such as Miami, Daytona International Speedway and the Kennedy Space Center. As part of their special Bricktastic weekends, Santa’s Helper Scavenger Hunt you can seek out five elf on a shelf style figures that have popped up around the MiniLand displays to collect a special event Duplo brick. 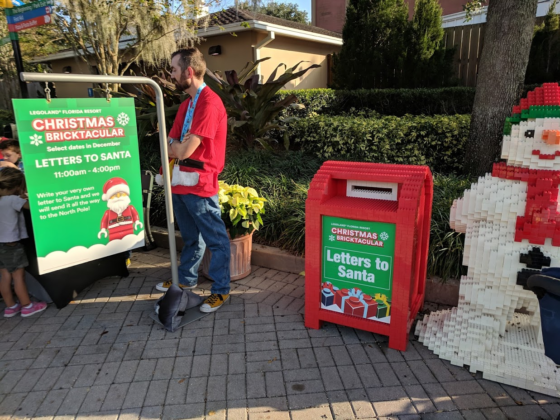 On this side of Miniland, you’ll also find stations where you decorate an oversized postcard to Santa and let him know your holiday wishes before placing it in the LEGO mailbox. 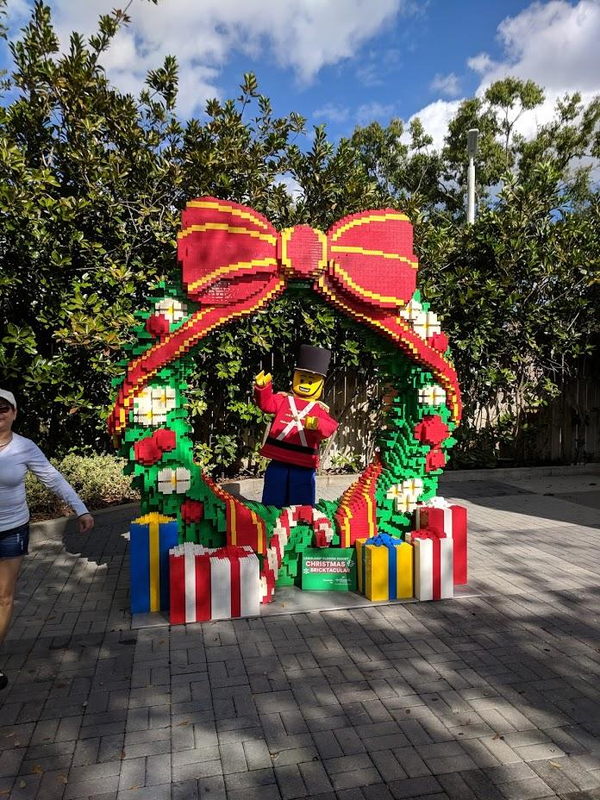 My little guy was especially fond of the next two holiday stations. 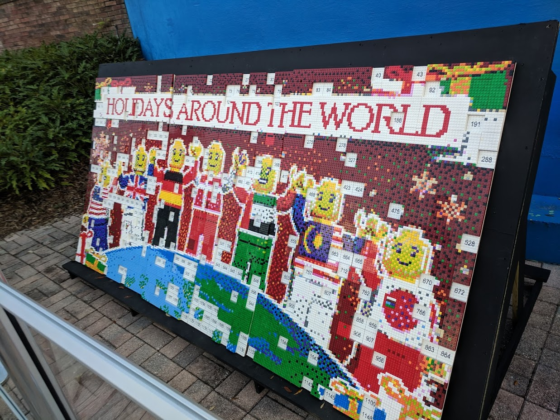 The Holidays around the world Lego mosaic build invites builders to join in the fun. 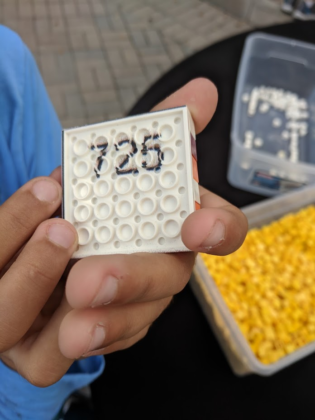 We were provided with a numbered square that had color dots that my little guy covered with 1×1 LEGO. 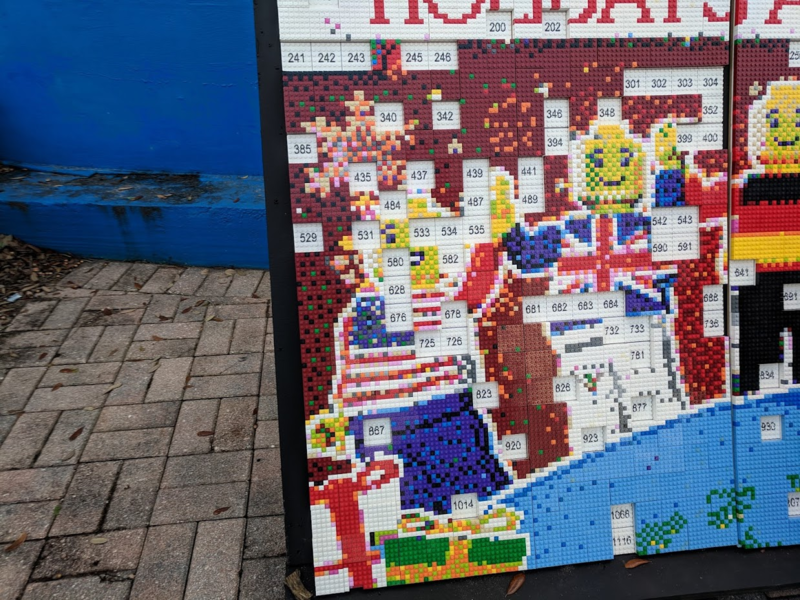 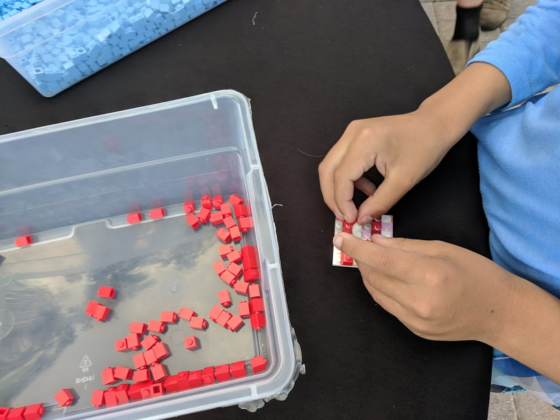 After he completed the task, his portion popped into the larger mosaic of Lego figures wearing sweaters emblazoned with flags from around the world. And next door was a table filled with a variety of LEGO bricks for the Holiday Themed Competition Build activity. It’s a pretty straightforward experience. They provide you a blank LEGO panel and you create your own holiday-themed Lego creation with a chance to win Legoland passes. 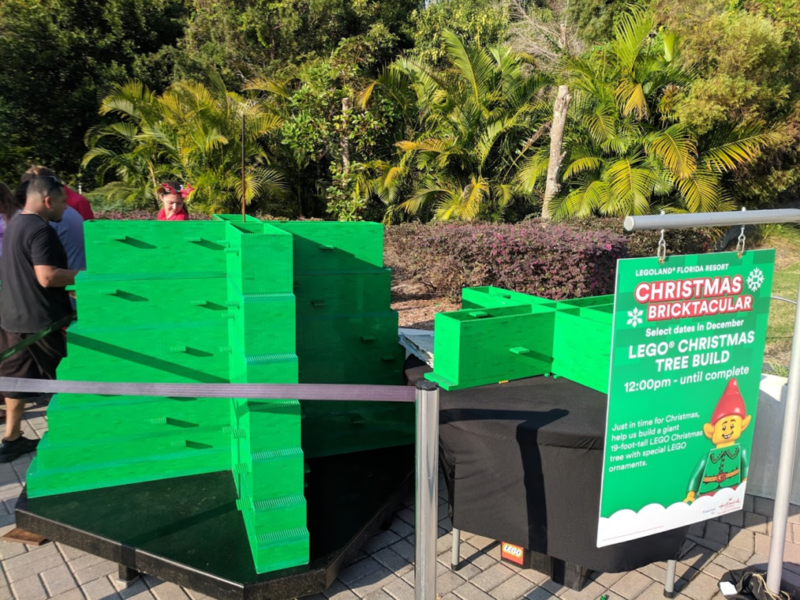 On the far side of MiniLand, nearing the pathway to The Great Lego Race, was the Lego Christmas tree build where layer by layer park guests could help build a giant 19-foot tall tree. 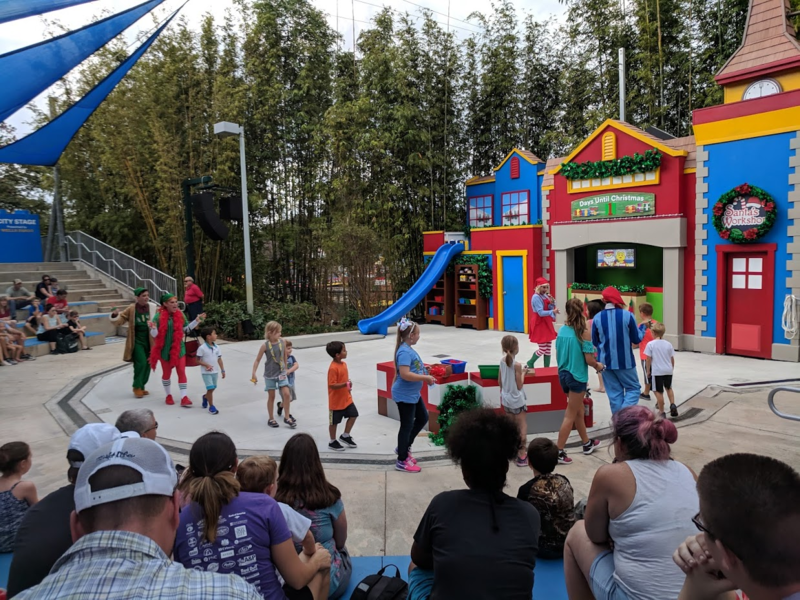 In addition to these activities, Lego Santa is available to meet with guests over in the Heartlake City. 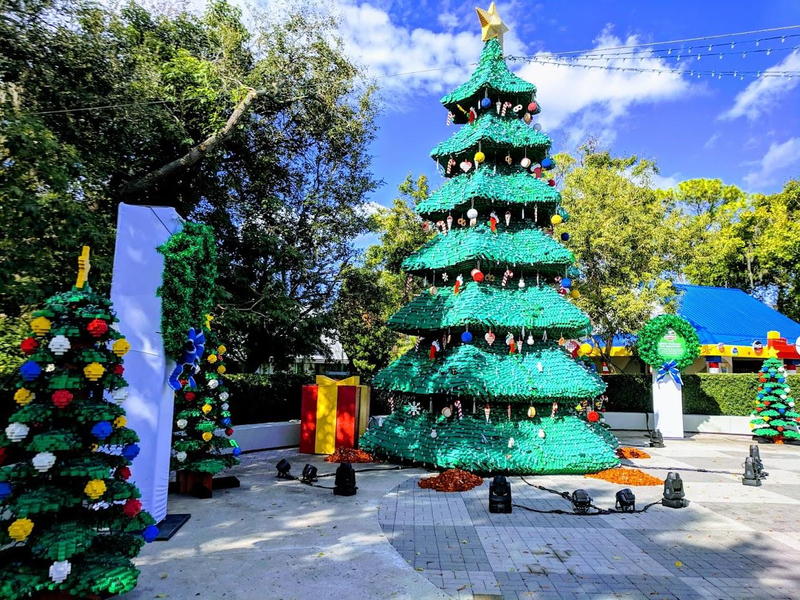 Finally, as our day came to close we paused to experience the LEGO Christmas Tree Spectacular. 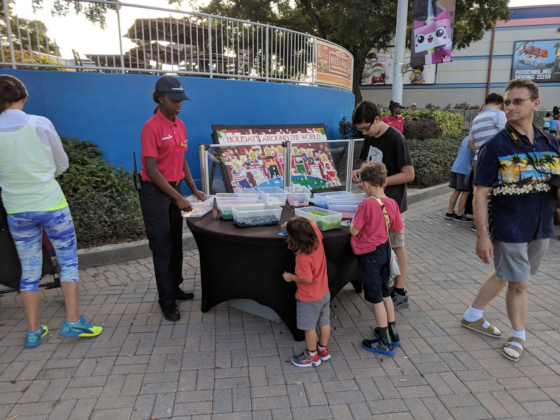 Some of our family stood near the presentation to enjoy the display while others enjoyed beverages from the adjacent Market Restaurant finding the view suitable from its patio tables and the rest before the walk back to the car appreciated. 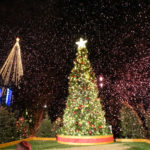 But we all enjoyed the light show put on by the collection of Christmas trees including the 30ft tall LEGO tree illuminating in various swirls and stripes of color synchronized to holiday music complete with the magical Florida “snow”. 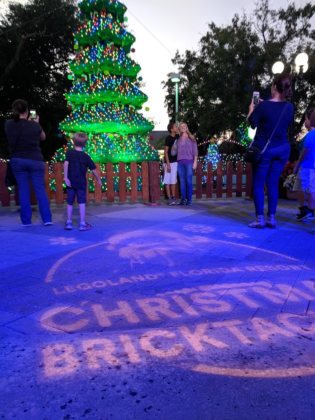 Legoland Florida’s Christmas Bricktacular runs on select days now through Christmas Day.